Water Tower Music (WTM39373) - 127+ min. 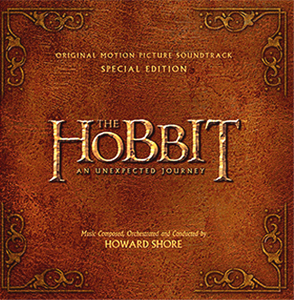 Produced by Howard Shore, except Disc 1 track 4 produced by Stephen gallagher, track 6 produced by Plan 9 and Disc 2 track 12 produced by Neil, Elroy & Liam Finn. Recorded, Mixed & Mastered at Abbey Road Studios; Music Programmer: James Sizemore. Score Editors: Kirsty Whalley, Rob Houston, Yann McCullough; Production Manager: Elizabeth Cotnoir; Music Supervisor: Karen Elliott; Production Coordinator: Alan Frey. Amazon UK is offering it for about 25#. They are also offering it as an MP3 download with a pdf containing the jacket notes. Very attractive, functional packaging using the leatherette digibook hard cover with two disc pockets and a stapled-to-spine 34 page booklet. The booklet also contains art graphics from the film in addition to photos of Howard Shore and London Philharmonic members. In addition to the usual credit listings, it also contains the lyrics of "Blunt the Knives', 'Misty Mountains' and 'Song of the Lonely Mountain'. It also has a music analysis of the score by musicologist Doug Adams (See 'The Music of The Lord of the Rings Films'). 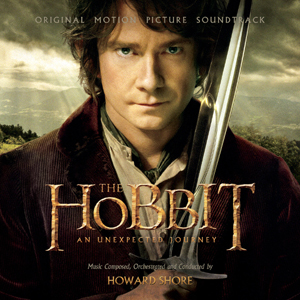 Howard Shore Radio Interview with Classic FM(UK). Water Tower Music (WTM39372) - 108+ min. Disc 2 track 12 produced by Neil, Elroy & Liam Finn. Choral Text by Philippa Boyens. Choral Text Translations by David Salo. See above SE version details for further credits details. Dealoz list of US, UK and Canadian sources from which to purchase. Amazon UK is offering it for under 8#. They are also offering it as an MP3 download with a pdf containing the jacket notes. It is also available for purchase at iTunes as a download for about $12us. The packaging of this standard edition is a two disc snap-in transparent jewel case with 12 page insert. The insert contains a few images from the film, the usual credits and essentially the same music score analysis by musicologist Doug Adams, indicated above in the Special Edition package.